If you are absolutely in love with the beauty of wood garage doors but not in love with the tremendous amount of time and money that goes into the proper maintenance of a wood garage door, then we have the perfect solution for you. 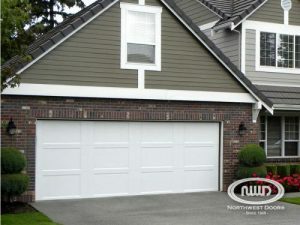 Northwest Doors–wood garage doors that are not wood doors at all. We at American Garage Door and Gate Systems in Denver proudly offer this great line of garage door products that perfectly fuse the beauty and character of wood garage doors with the durability and headache-free maintenance of an all-aluminum garage door. We dare you to come and take a look at these sturdy doors. We think that you will be thoroughly impressed by what you see. It is virtually impossible to tell the difference between these aluminum doors coated with a wood grain powder finish and the real deal of a wood door itself. The wood grain powders come in 8 different finishes for you to choose the perfect look for your home. The finishes are extremely high quality and very long lasting and are often mistaken for real wood with how realistic they look. With this extremely resilient door, you don’t have to worry about splitting or cracking, even in the most extreme of weather circumstances. These doors do great even in coastal areas where the rate of corrosion is high. You can pretty much expect that this door will last as long as your house does. You can even feel good about taking care of the environment by ordering one of these doors. A wood door, of course, requires the sacrifice of some trees to provide the wood for construction but these doors are manufactured with the best materials available, and the company committed to sending zero waste to the landfills! These doors are virtually maintenance free. With wood doors, you have to worry about the color fading with constant sunlight and even the wood cracking or splitting as weather conditions expand and contract the material over time. All of those worries go out the door with a Northwest Door. The only thing you should do maintenance wise is to rinse it off every once in a while, to keep the dirt off. That’s it! How easy is that? Your initial investment in a Northwest Door will admittedly be a little more than what you would pay for a wood door, but the long term benefit is worth it. Over time you will not spend hours maintaining your garage door, and you will not be buying new varnish or paint to keep it looking nice and sharp. You just call us here at American Garage Door and Gate Systems to pick out your new wood door that is not a wood door at all and have it installed and spend the next several years enjoying a beautiful, durable and virtually maintenance free garage door! You will constantly look back and thank yourself for making the investment in something that you can enjoy for so long and adds such beauty and value to your home, your biggest lifelong investment.